Excellent on the stove or BBQ, and beautiful too. Ultimate Chef – after researching the best practices for skillets, frying pans and paella pans, Martin decided to create the most superior pan possible: fast heat uptake, even & consistent transference, smooth finish with high non-stick properties, high food safety standard, diverse usage capabilities, unmatched durability, and a proven track record as the very best tool available to the home chef, creative foodie, and the professional wanting only the very best. Martin designed more than just a frying pan, each one is a work of art, perfectly shaped with beveled edges. The floor is hand hammered to facilitate a reservoir of oil and steam. The handle is woven, reducing the heat transference and the risk of burns. Every pan is stamped with a maple leaf and ‘MJ. Reinhard’. The pans are crafted from Carbon Steel, the hands-down favourite with professional chefs in Europe. This very smooth, dense metal is stronger, lighter and more ductile than cast iron, facilitating lower heats and faster cooking times. 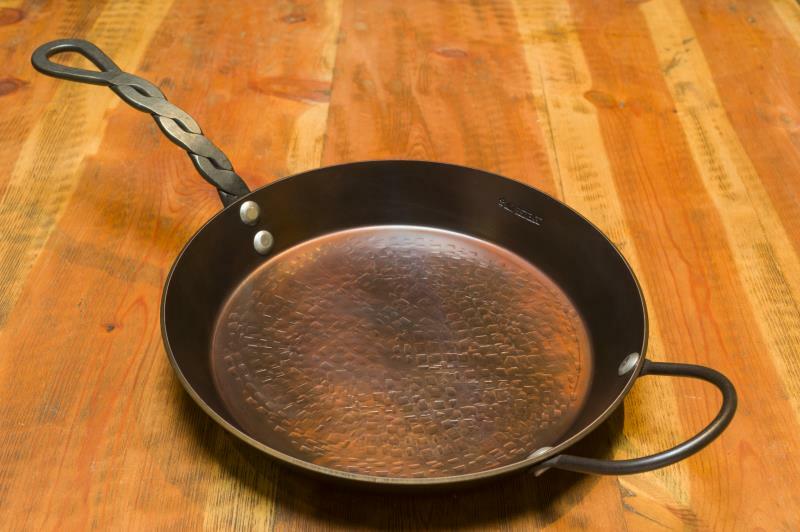 It readily acquires a truly nonstick surface – a patina of polymerized oil to produce a high caliber cooking surface. These pans are available now, we are pleased to process your order, or welcome your visit to the store. Copyright © 2018 - 2019 Willow Creek Forge – by Dreamweaver Webs Ltd.